Have you ever enraged a murderer? Redhead Nell, a civilian psychologist with the US Navy, takes her dream job at a submarine base to escape a protective family and build a life of her own. Meeting James, the handsome skipper of the submarine Scottsdale, is a bonus she hadn’t expected. When Nell is attacked after a body is pulled from the local river, two investigations swing into motion, with no obvious link between them. The killer plots to keep the cases separate and conceal the damning secrets from his past that would lead to a connection, and his demise. As his attempts to complete the cover-up fail, his frustration and rage turn toward the person who stands in his way. 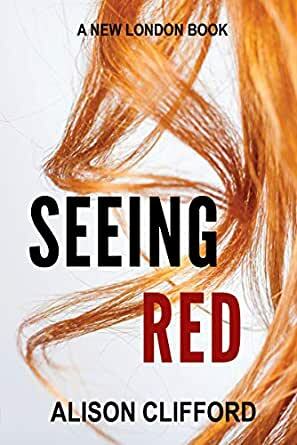 Seeing Red is an unusual combination of clean romance and light-hearted suspense. Had someone tried to described the book to me, I probably would have laughed in their face, but it works! It really does work! Check it out. You won't be disappointed! Clifford works a spellbinding weave of two opposite genres, combining them effortlessly into a seamless union. The only reason I can't give her 5* is just the tiniest need for one last swipe with the polish, so to speak. It needed a little more work with a professional proofreader and then it would have been sheer perfection. Keep up the good work, Clifford! This was a great suspense story as well as a romance. It was interesting reading how the author wove together the mystery with the growing relationship between James and Nell. Great set of secondary characters, too. The plot kept me engaged to the end. The book is very well written and the combination of the two genres work incredibly well in this story. Nell is busy falling in love. But while she is worrying about her family's acceptance and how she'll cope in a relationship with a man who will often be working away at sea, she is completely oblivious to the fact she witnessed a neighbour disposing of his wife's body. As the police investigate, Nell is getting engaged while her neighbour is making plans to eliminate the one link between himself and his wife's death. The read also gave an interesting insight into the lives of the men and women who are in the navy. An enjoyable read with likeable characters. Seeing red- this started out really good. A mystery murder. I had to catch up with the back and forth but once I did it was great. Until 25% or a little before chapter sixteen. Sadly I do bedroom scenes. It didn't show anything untill just into chapter sixteen but it was too much for me. It was too fast for one thing and for another I don't think it added to the actual developing storyline. Sorry.